It's quiet inside The Local Beer Bar in Eureka, where co-owner Darren Cartledge is getting ready for Sour Beer Night. The crowd will come later. Right now it's a couple of hours before opening, and Cartledge has been readying the taps and putting up colorful chalked skateboard signs describing sour after sour. Sour beers, he tells me, are like sushi. Think about sushi, and wham. The craving doesn't stop until raw fish slips onto your tongue. Think about sour beers, if you're hooked on them, and nothing else will do. The tartness and complexity start swirling in the imagination. They don't stop until it seems normal to pay $10 and up — way up — for one bottle of beer. If you haven't fallen prey to sour beer's seduction, Cartledge makes a great tutor. He'll tell you to let your sour warm up before you drink because its flavors come through better at around 55 degrees Fahrenheit. He can introduce you to a wider range of sours than just about anywhere else in Humboldt — sour stouts, sour IPAs, dry-hopped sours, fruit sours and wheat sours. Like so many beer styles in the United States, sour beers have soaked through category walls and dripped down onto just about anything at least faintly acidic or oddly funky. Some brewers use wild yeasts, welcoming them to invade open vessels. Some add cultivated strains of yeasts or bacteria that increase the acidity. Some age sours for years, some barely at all. And while Belgium was long known as sour central, not all traditional Belgian beers are sours. The most expensive sours are often those aged the longest, allowing time for a range of flavors to meld and evolve. "If you want a good sour, you're looking at six months to two years of aging," Cartledge says. "In a really good sour, you want to find a lot of complexity. With the ones that are rushed, you get a beer that is sour for the sake of being sour." On this April night, The Local will be featuring 11 different sours, beers as varied and colorful as the bar's chalked signs. It seems like the perfect time to steel my nerves and try to appreciate a beer style I've never warmed to. Cartledge is reassuring. "The first time I had a sour, I thought it was disgusting," he says. "There's a bunch of bad sours out there." I've been to some wonderful breweries, places with beers I otherwise adore, where my reaction to their sours is: "Tastes like a mistake." At other breweries, I land in the "not my favorite, but sort of drinkable" realm. I'm never going to love this style. Cartledge says that's fine — people who explore a bit and still don't like sours are going to save themselves a bunch of money. Your big takeaway here: Don't judge sours by any one brewery's offerings. The style is just too varied and individualized for that. I was pleasantly surprised by some of the beers Cartledge poured, and you might be, too, if you try the sours at several breweries and stop in at beer bars likely to carry versions from around the U.S. and beyond. Soon after you'll know whether you've picked up that sour craving. 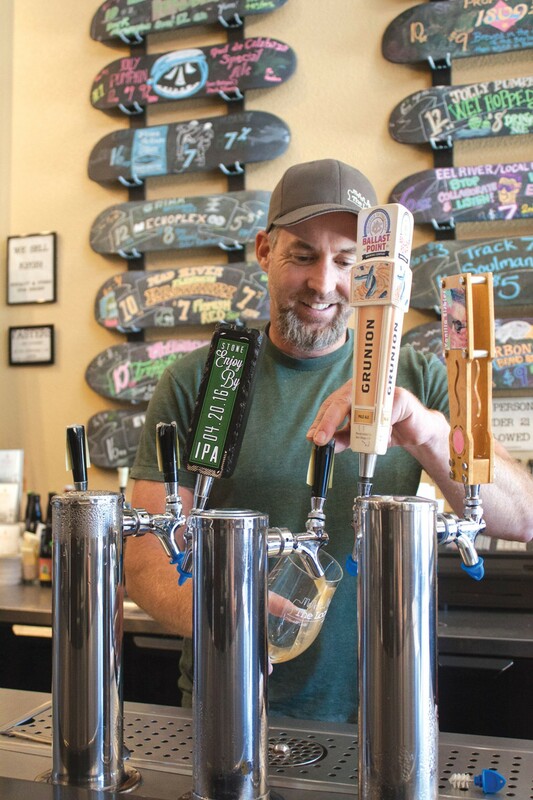 Humboldt's most dependable sources of locally brewed sours are Redwood Curtain in Arcata, which always has at least three or four on tap, and at Humboldt Regeneration in McKinleyville, which right now has six of them. Now and then, some other local breweries roll out a sour, too. To sample a good smattering of sour beer styles made elsewhere, try Dead Reckoning Tavern in Arcata, which always offers at least a couple, or The Local, which usually has around five on tap, and many more bottles in its cooler. May 16-22: You're still not too late to celebrate American Craft Beer Week with all-day "hoppy hours" continuing through Sunday at Mad River Brewery in Blue Lake. Thursday, May 19 – Need more ballast? Sail on to a Ballast Point tap takeover at Dead Reckoning Tavern, where roughly 10 beers from the San Diego brewery will be on tap from 2 p.m.
Saturday, May 21 – History sizzles with the Redwood Coast up in Smoke barbecue and beer tasting at Redwood Acres, benefitting the Clarke Historical Museum. More than a dozen different barbecue masters, both amateur and professional, will grill ribs and chicken in a judged competition, and at least six breweries will be pouring. The 11:30-a.m.-to-5 p.m. event includes all you can taste and all you can sip for $30. Food only, for ages 5 to 20, is $15 and kids under 5 get in free. A kid zone is planned for this family friendly afternoon. Wednesday, May 25 — Taste four sours from a famed Belgian brewery on Cantillon sour night at The Local Beer Bar. Seating begins at 5 p.m. and is limited to 23 people. $50 for four 6-ounce pours. Yes, really. A sign-up sheet for reservations is at the bar. June – The snip and sip folks are doing it again, with the second annual "Beer for Balls" at Six Rivers Brewery to raise money for Nor Cal Pet Rescue's spay and neuter effort. The brewery will donate $1 from every Hammond Trail Cream Ale and specialty spay cocktail to making sure those pets aren't reproducing wantonly when we're not looking. The big finale comes on Saturday, June 25 with a dog-friendly party and raffle. Tuesday, June 14 – Beer is nature's way of telling us to be creative, so bring your artistic spirit to Paint Night at Lost Coast Brewery. The class runs from 6 to 8 p.m. for $35. Saturday, June 25 – Think Emerald, not Bermuda, for "Summer in the Triangle," a party that will sprawl out from the Eel River taproom into the beer garden and parking areas beyond. The 2-to-6-p.m. celebration, kicking off Eel River's 21st year, features music from Ishi Dube and two other reggae bands, a family area including a tie dye booth, and at least one newly released beer, along with Eel River favorites. Carrie Peyton Dahlberg really tried to like sour beers, but some things just aren't meant to be. Send her your beer news at beerstainednotebook@gmail.com.